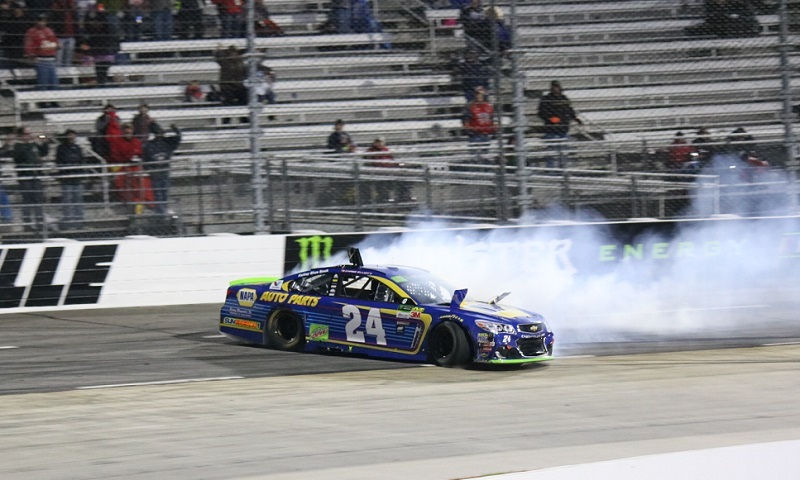 MARTINSVILLE, Va. — Chase Elliott appeared headed to certain victory and a spot in the championship race at Homestead-Miami during the closing stages of Sunday’s First Data 500 at Martinsville Speedway. But a clash with Denny Hamlin in turn three, coming to two laps to go under the lights, both ended Elliott’s chances at victory and led to a war of sheet metal and words after the checkered flag had fallen. Elliott, who led 123 laps in total during the closing stages, first used a muscle move of his own to work past then-leader Brad Keselowski on a restart with four laps left in regulation. He stayed with Keselowski, who chose the high lane for the green flag, through turns one and two before shoving Keselowski out of the groove entering turn three. That afforded Elliott the lead, while Hamlin moved through behind him to claim the second spot, looking to complete a comeback from a speeding penalty incurred following the conclusion of the opening stage. But Elliott didn’t keep the lead for long. Hamlin sailed his Toyota off into turn three on the next lap as Elliott slowed for the corner, making heavy contact with the back end of Elliott’s Chevrolet that sent the young gun careening out of control in the center of the corner. Elliott spun up the track and made contact with the outside wall, ending any vestige of hope he had at claiming a breakthrough victory, while Hamlin got away with the lead despite the battle of fenders. Hamlin held the lead until the final lap, when he was eventually moved from the lead in his own right by teammate Kyle Busch, while Elliott limped home a lap down in 27th with his temper flaring. That frustration boiled over on the cool-down lap, when Elliott ran Hamlin up into the outside wall on the backstretch, before the two met on pit road for a heated conversation after climbing from their cars. Though the nature of the elimination-style playoffs can lead to contact and exceptionally hard racing for victories, Elliott said he felt what happened with Hamlin crossed the line Sunday night.